See more objects with the color antiquewhite silver gainsboro grey or see all the colors for this object. This is a Poster. It was printed by Plaats Maken and firm: Catalogtree. It is dated designed January 2008 and we acquired it in 2009. Its medium is offset lithograph on white wove paper. It is a part of the Drawings, Prints, and Graphic Design department. This is one of six posters in the Flocking Diplomats series. 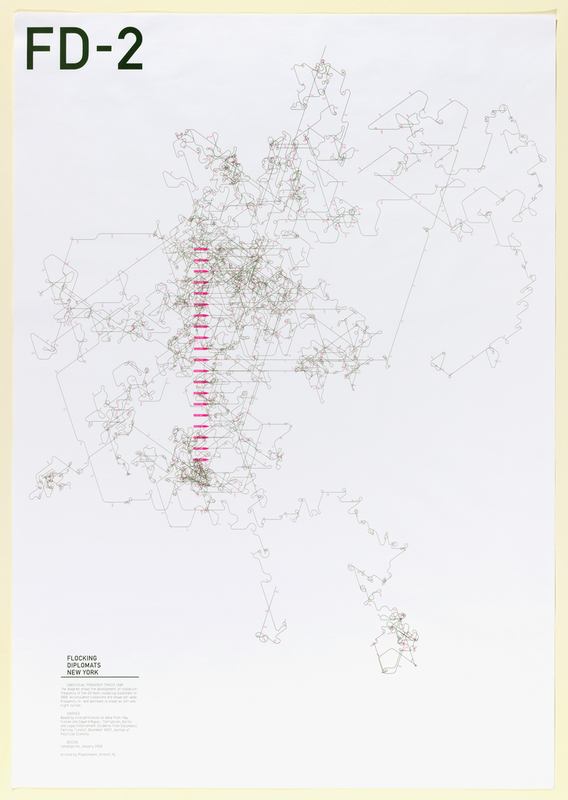 In each poster, data is translated into a graphic that maps the parking violations of diplomats in New York City. The posters are grounded in humor, both in the concept of tracking the diplomats’ transgressions and in the visual presentation of the information. Infographics—quantitative information that is visually displayed through graphs, charts, and other formats—highlight the immense volume of data available to us today as well as the subjective nature of its representation. This object was donated by Joris Maltha and Daniel Gross. It is credited Gift of Joris Maltha and Daniel Gross.